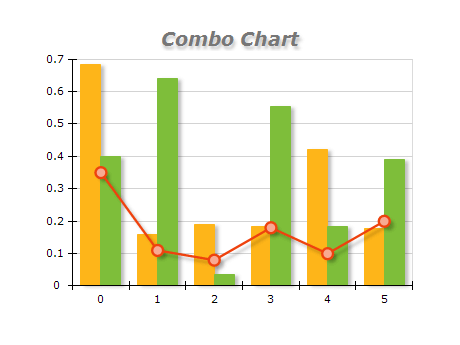 The Combo Chart is versatile charting type, which allows you to specify a series type per each values data grouping, which is displayed in the combo chart area. This is a combination of clustered bar chart and line series. The example demonstrates a combination of Bar, Point and Smooth Area chart series in 3D. In Pareto Chart individual descending values are represented by bars, and the cumulative total is represented by a line. The example demonstrates the ability of the timeline and date/time scales to skip date time ranges, when it is expected that there is no data for them. Common applications of this feature are financial charts that usually display only working week days as stock markets are closed on weekends.